TNA, or Impact Wrestling as they are known, is having a hard time at the moment. In fact, has been having a hard time a lot in recent years, whether it be wrestlers leaving the company, bad business decisions or poor attendance, which has left the company under a lot of criticism. But now and the past, they've had one hell of a roster that have given us some of the greatest matches and moments over the last 16 years. Not only has the Impact roster been built around many former big WWE stars, as well as homegrown talent, Knockout's and the X Division talent, but Impact has also brought in many former superstars of other company's who had been out of the limelight for sometime. And not only did Impact bring them back to TV, but relevance to as their booking, promotion and popularity from the original cult like fan atmosphere completely revived their careers after much time spent away from the ring. This is something that Impact Wrestling have done many times throughout the years, with these being 10 of such. 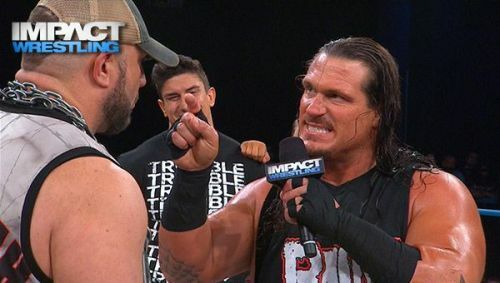 When Rhyno joined TNA Impact Wrestling in the Summer of 2005, it hadn't actually been very long since we last saw him on WWE TV. Other than a quick cameo match with Sabu at the ECW One Night Stand, Rhyno had last been full-time with WWE just a few months earlier, having been released from the company that April. However, it had been quite a while since Rhyno was last relevant in WWE. Rhyno had a strong push during the Invasion, and a decent one in 2003 after his return from neck surgery, but things went downhill in 2004. He mostly teamed with Tajiri, and after a few unsuccessful Tag Team Championship matches, Rhyno was relegated to Sunday Night Heat for about 6 months before he was fired. When Rhyno joined the then TNA, he was immediately given a monster push. He was featured in the main event of 4 of the 5 remaining TNA pay-per-views of 2005, which included winning the NWA World Heavyweight Championship at Bound For Glory. He remained a prominent player in TNA for the next 4 + years, feuding with the like of Kurt Angle, Sting, AJ Styles, Rob Van Dam and others before becoming a casualty of the Hogan/Bischoff administration. After a cameo return to Impact Wrestling in 2014, he returned to WWE in 2015, where he still remains today.